Side-scrolling jump'n'run platform game suitable for all ages. It has 20 huge levels set in 4 different worlds: Forest, Ancient Egypt, Medieval Castles and Space Ship. At the end there is a fun Big Boss level in shoot'em up style. 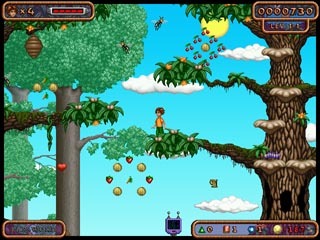 Game has hand drawn high resolution graphics with up to 3 background paralax planes, dozens of various enemies, thousands of gold coins, jewels and fruits to collect, moving platforms, doors, levers, ropes, ladders, slippery surfaces, many secret areas in each level, stereo sound positioning and ambiental music tracks. There is also an interesting story between worlds. "Bud Redhead - The Time Chase" is localized to 9 languages: English, French, German, Spanish, Portuguese, Swedish, Dutch, Danish and Croatian. In unregistered version you can play only the first 3 levels. However, if you wait long enough at the main menu without pressing any key or moving the mouse the game will go into a demonstration mode. There are 4 one-minute demos (one for each world) so if you are patient enough you can have a peek at what you will get if you register.